Is Social Security Disability an Option for People With Depression? Major depression is one of our nation’s most common mental disorders. In 2015, 6.7 percent of adults—or 16.1 million adults—in the United States suffered from at least one major depressive episode, according to The National Institute of Mental Health. The World Health Organization (WHO) has found that major depression carries the heaviest burden out of all of the mental and behavioral disorders. Accordingly, if you or someone you love suffers from depression, then it is important to know more about the symptoms of depression and how to qualify for Social Security disability benefits. Deep feelings of helplessness and hopelessness. When you begin to feel that nothing will ever get better and there is nothing you can do to improve your situation, you lose the physical ambition to work. As a result, your duties are either not accomplished or are done poorly, causing you to be unable to keep a steady job. Loss of interest, energy, and concentration. When you fail to have interest in anything, your job suffers. Much like feelings of hopelessness, lost interest will affect your concentration, while loss of energy can make even the smallest task seem exhausting, thus putting your job prospects at risk. Appetite or weight changes. A rapid change of more than five percent of your body weight can cause severe physical health issues. Losing weight—as a result of stress—can result in malnutrition and weakness. While weight gain can put pressure on your bones and muscles, as well as cause breathing issues and heart problems. These physical issues can severely limit your ability to work properly. Sleep changes. Insomnia or oversleeping—also known as hypersomnia—can drastically affect your mood, as well as cause you to be unreliable for work shifts. If you do manage to make it to work on time, your work may suffer. Anger or irritability. When you are feeling agitated and restless, your tolerance level is affected. As a result, your temper can shorten, and everything and everyone can get on your nerves—in some cases, even violently so. Reckless behavior. Engaging in reckless behavior such as substance abuse, reckless driving, or dangerous activities puts your health at risk, but if you do these things at work, you could wind up putting others in danger. Unexplained aches and pains. An increase in headaches, back pain, aching muscles, and stomach pains can be harmful. These symptoms can also cause you to be physically unable to perform your job. If you experience any of these symptoms, make sure you seek medical attention as soon as possible. Depression is a serious illness that requires treatment, and it is important to get an accurate diagnosis so that you can get effective treatment. You meet the requirements of Section 12.04A and 12.04B in the Listing of Impairments. You will qualify in this way if you have medical documentation of depressive disorder characterized by five or more of the following: depressed mood, diminished interest in almost all activities, appetite disturbance with weight change, sleep disturbance, observable psychomotor agitation or retardation, decreased energy, feelings of guilt or worthlessness, difficulty concentrating or thinking, or thoughts of death and suicide. Also if you have the extreme limitation of one or the marked limitation of two of the following areas of mental functioning: understanding, remembering, or applying information, interacting with others, concentrating, persisting or maintaining pace, adapting, or managing oneself. You meet the requirements of Section 12.04 A and 12.04C in the Listing of Impairments. You will qualify in this way if you have medical documentation of depressive disorder characterized by five or more of the following: depressed mood, diminished interest in almost all activities, appetite disturbance with weight change, sleep disturbance, observable psychomotor agitation or retardation, decreased energy, feelings of guilt or worthlessness, difficulty concentrating or thinking, or thoughts of death and suicide, and your mental disorder is serious and persistent. 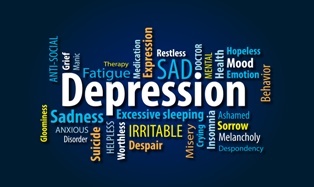 In order for depression to be considered serious and persistent, you must have a medically documented history of it for at least two years and evidence of: (1) medical treatment, mental health therapy, psychosocial supports or a highly structured setting that is ongoing and that diminished the symptoms and signs of depression; and (2) marginal adjustment, or the minimal capacity to adapt to changes in your environment or demands that are not already part of your daily life. Your condition is equal in severity to another condition in the Listing of Impairments. If you can prove that the effect of your depression is the same as the effect of another condition described in the Listing of Impairments then you should be eligible for Social Security disability benefits. You cannot work because of your condition. If you can prove that your symptoms keep you from working, or engaging in substantial gainful activity, then you should qualify for Social Security disability benefits. Remember, you only need to prove that you are eligible in one of these four ways. Although the Social Security Administration acknowledges that depression is a disabling disorder that should qualify for disability benefits, not all depression claims are approved. Our experienced lawyers can help you file a complete claim and ensure that the claim is properly handled. We will make sure that your claim receives the attention that it deserves and that you receive the decision that you deserve. To learn more about how we can help you get the fair benefits that you have earned, please read our FREE report, Five Most Frequently Asked Questions About Social Security Disability, or call us directly for a free consultation.